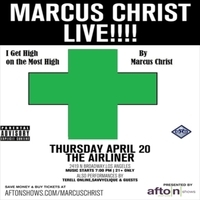 I Don’t Care is a club banger from southern style hip hop artist, Marcus Christ. The single makes use of echo and dramatic synths to create an escalated sense of excitement throughout the song. Marcus’ delivery is characterized by a laid back and methodical demeanor, like when someone speaks slowly but with an intensity that tell you they absolutely mean business. It’s a pretty straightforward and high quality club jam, but I could picture people enjoying this on a late night drive through the neighborhood with friends lookin’ for the next kick back and just having a ball. One gets the sense that stylistically there is some 90′s west coast influence. What began as a hobby for Marcus has evolved into an illustrious career. Previous time spent in jail has only served to be a source of renewed inspiration for this determined and seasoned hip hop artist.